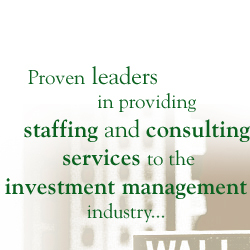 "Behind every great investment manager is a team of professionals allowing that greatness to happen"
The McNamara Group (TMG) is the proven leader in providing operations staffing and consulting services to investment management and investment advisory firms. Working in close partnership with its clients, TMG alleviates the burden of day-to-day operations requirements by delivering unparalleled service from its experienced team of industry professionals. Whether it's filling temporary or permanent staffing needs, enhancing existing operations process, or implementing vital technology components, TMG has a proven track record of optimizing and executing back-office functions, enabling managers and advisors to focus on their core competencies and gain competitve advantage.